Home / TESTIMONIALS / Adults / NACD Makes Adults Smarter Too! My name is Bridget, and I’m living in Dublin Ireland and working full time as Senior Manager in financial services. I have a Master’s degree. In May 2010 I went to London to meet Bob Doman. I had seen the amazing difference that Bob and Sara Erling had made working with my niece. I was curious to know if I, an average adult, could benefit from doing a similar NACD program. I was aware that I wasn’t as efficient as I could be. I could see that some of my colleagues were more organised, could process information faster, and were more logical in their approach. In May Bob carried out the assessment, which involved a number of visual and auditory tests. A couple of days later, he gave me a program tailored to my needs. Since then I’ve invested around an hour a day, 5 days a week. In that time my baseline processing scores have increased significantly. More importantly, I’ve experienced significant behavioural changes. I’m more effective and confident in work. I have better quality leisure time. My analytical and problem-solving skills have increased. I’m also a much better reader. My husband has observed changes too, and I have shared these with you below. But first I’m going to tell you a little more about what’s happened to me. We tend to have a lot of conference calls in work. I was brilliant at tuning out and multi-tasking whilst on the call. While listening, I’d respond to e-mail and draw up ‘to do’ lists, which meant I’m wasn’t engaging in the meeting. So I asked Bob to help me with my listening skills. I can now really focus at meetings. I contribute to the discussion, ask relevant questions, and at the end of the meeting, I understand the implications for our department. I can also understand other peoples’ perspectives better. Bob also helped me with my focus and attention skills. As a result, my concentration improved dramatically. I now start and finish each task before moving to the next one. I don’t allow myself to get distracted. I believe both of these changes have made me more productive and effective at work, which has reduced my stress levels. I also have more confidence in my abilities. You may know that Ireland is in deep recession and the Government has announced details of its 4-year austerity plan. In June, in anticipation of the recession, we took a key decision to sell our house. It sold quickly, which meant we signed a lease on a rental property in July. This provided the perfect opportunity to re-organise our life. We moved closer to the town, which meant that I can walk to and from work. When we go to a restaurant or to meet our friends at the tennis club or in local restaurant, we can walk home. We made other changes, such as hiring a cleaner on Friday afternoons and ordering the shopping online on Thursday evenings. We also re-organised our furniture and put a lot of things we didn’t need into storage. So now everything in the new house is in place and consequently, the house runs more efficiently. This has really increased the quality of our leisure time on weekends. This is a big change for me because previously I spent most of my time on the weekends doing cleaning, shopping, and running around doing errands. I never got a break, whereas, now we have fabulous weekends, as everything is taken care of during the week. Our decision to sell our home has also really paid off, as a similar house to ours is now on the market for an asking price which is 20% less than what we sold for – and its only 4 months since we sold. I attribute my ability to make these life decisions and changes to my increased organization and improved thinking skills. The recession also got me thinking about my own finances and the future. I wanted to put some financial plans in place that would give us more options for later in life. I started two Company share save schemes, and I also started paying additional voluntary contributions into my pension. I also made some short-term changes which has resulted in reducing our outgoings on a monthly basis – e.g., I reduced my husband’s car insurance by adding him to my policy. We reduced the home insurance, as we no longer needed buildings covered. For the first time ever, I completed a medical tax return and claimed my Club Subscriptions in work, as my files were more organised and I had the relevant receipts. Now I feel much more in control of my finances and have got a lot of pleasure out of putting the savings and pension plans in place. As I’m working full time and have a busy life, I didn’t really have time to fit in the NACD program. I used to try and do it when I came home from work about 8 o’clock in the evening. This didn’t work because I was too tired. So I agreed with my boss that I would start at 9.30am. This enabled me to do it first thing in the morning when my concentration was good. This is now working well, and I can see the difference in the Simply Smarter scores. I will admit that I have good and bad days like everybody else. However I always like it when Bob reminds me that it is not about the score, it is about the behaviours. One of the behaviours I use frequently now is to look at what’s working well and what’s not working well, both in terms of my life at home and at work. I’m not afraid to try out different solutions to see if I can get a better result. When I first went to visit Bob, I wasn’t a good reader. He was taken aback at the time, as he wondered where I got my information. He really encouraged me to read a lot more and to listen to audio books. I now always have an audio book on my iPod, which I listen to walking to and from work every day. I also love reading the newspaper on a daily basis. As a result of this, I’ve noticed that I’m much better reader at work too. I get a grasp of the information much faster. I have to say that this has been one my favourite changes about the program. My husband now finds our house more efficient. He can find everything he needs because it is in its place. He’s noticed that I’m a better cook. He sees less wastage, more variety and use of fresh produce. He likes all the different cooking techniques like flambé, bourguignon, soup made with fresh stock, etc. He thinks we’re working even better together to come up with the optimum solution for us. Finally, he finds our house to be even more harmonious. He attributes this to the fact that I’m much happier, and that makes him happier too. Last May I set out to find out if NACD could make me smarter like my niece. I decided to give it 6 months to see if it worked. In return for my investment of an hour a day, I feel that I have genuinely gained enormously from the program. I feel at the top of my game now. I’m much more organised and in control. I feel more effective and happier and have more time to relax and enjoy the weekends. I’ve decided now to keep going for a further 6 months with NACD because I’m getting so much out of it and I feel that I can do even better. If you have any queries about my experience, please email me at bridgetsheehan@ymail.com. I would encourage you to talk to Bob or Sara to find out more about how this program can enhance your life too. The graphs below illustrate Bridget’s improvement in her sequential processing skills over a six-month period. Bridget’s scores are represented by a star. The graphs have been designed for and are based on data we have collected from the NACD Foundation’s Simply Smarter Project. The black line between the red and yellow zones on the graph represents the average processing level of each corresponding age group. The colors on the graph represent how well the individual is doing relative to others of their age. The Red Zone is a danger zone! Individuals scoring in the red zone have processing skills below 50% of those in their age range. These individuals are not processing as well as they should be or need to be to realize their potential. It would be expected that those in this range are struggling more than necessary in many, if not most, aspects of their lives. The Yellow Zone is an intermediate zone. Those that test in this area are functioning higher than 50% of those in their age group, but they are possibly still struggling and have not yet achieved levels of processing that are permitting them to fully realize their potential. The Green Zone is the goal. The Green Zone represents those who are processing well and the goal most people should try to achieve. In this group we would typically find those with superior skills and function. Those scoring in the Green Zones should have short-term memory, working-memory, and executive mental functions that would permit them to excel. In June for Bridget’s auditory forward digit span, which represents auditory short-term memory, and her reverse auditory digit span, which represents auditory working memory, she tested at a 6, below the average for her age group and in the Red Zone. In six months she increased her processing in both of these critical functions to 10s, putting her into the superior range of the Green Zone! In visual forward digit spans, representing visual short term memory, she initially scored a 7, which put her right at the average point for her age group and on the line between the Red and Yellow Zone. Her reverse visual digit span, representing her visual working memory, initially placed her at an 8, in the Yellow Zone. Six months later she scored an incredible Green Zone 12! Her change in function is representative of the work she has done with the Simply Smarter System. Sequential processing is a key component to changing focus, attention, communication, learning, conceptualization, visualization, comprehension, organization, complexity of thought, motivation, and overall well being. 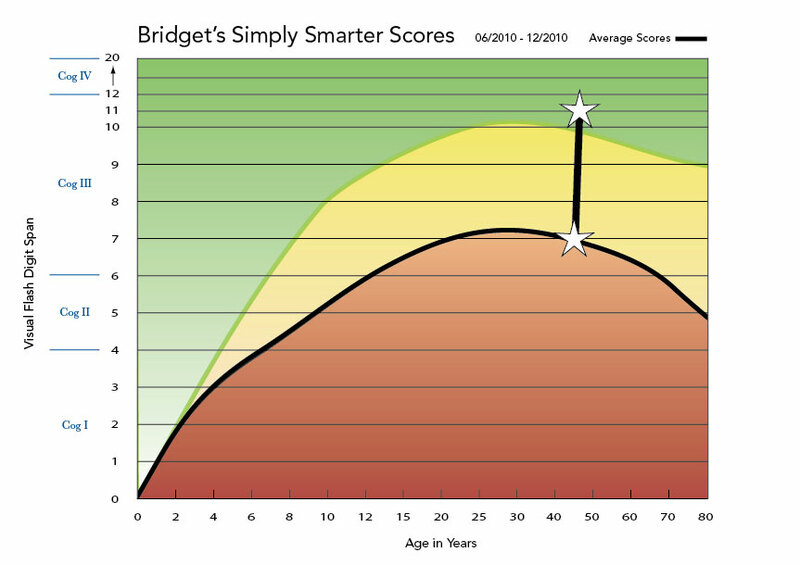 Simply Smarter is an essential tool for adults and children to help increase their overall function and productivity. Keys to Bridget’s success were her motivation, the intensity with which completed her activities, and her consistency.